It’s no secret that trans fats are bad fats and that we shouldn’t eat them. We’ve been hearing that message for a few years now and reading labels within an inch of our lives to make sure we’re not buying them. We’ve even bought foods previously engulfed in this wicked substance because right there on the front of the package was the Zero Trans Fats label, bragging that the newly formulated recipe was free of iniquity. But are those foods truly free of trans fats? 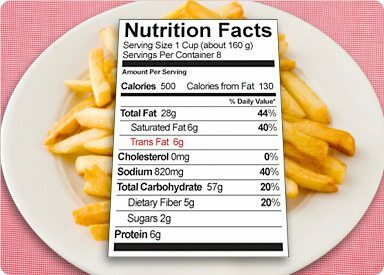 What is trans fat anyway… and why is it in your food? WHAT IS IT DOING IN YOUR FOOD? Trans fatty acids are created through a process called hydrogenation, which forces hydrogen into a highly heated oil to create a solid product. They’re added to foods as a cost-cutting measure: Manufacturers stand to profit by using these cheap fats instead of healthier, more expensive ones. The deal with trans fats is that, like saturated fats, they raise levels of LDL, or low-density lipoprotein, the “bad” cholesterol. Saturated fats, however, also raise levels of HDL, or high-density lipoprotein, the “good” cholesterol. Trans fats, by contrast, reduce only HDL levels. Though trans fats have been seriously studied for only the past 10 years, some research indicates that trans fats could increase your risk for cancer and diabetes and may even cause complications during pregnancy. Next time you’re in the grocery store, make it a point to avoid hydrogenated anything (and partially hydrogenated oils, as well). Choose instead to give your body the healthy foods you need; there’s plenty of good stuff to fill your shopping cart.